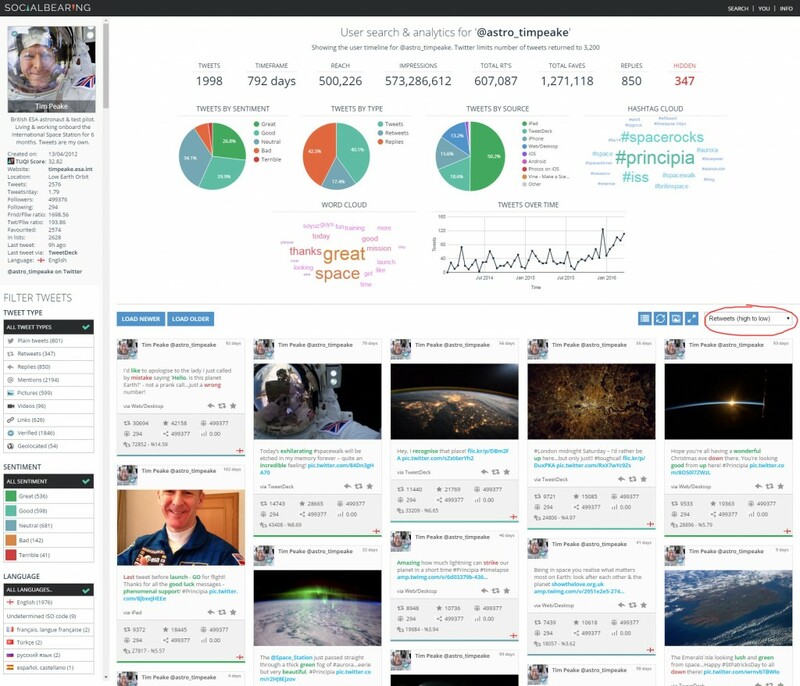 Ever wanted to view your most retweeted tweet, or the top retweeted tweets from any Twitter user? Social Bearing’s Twitter handle search allows you to do just that. You can look up the latest 3,200 tweets for any Twitter handle which includes in-depth analytics and the ability to sort tweets by retweets, favorites and several other metrics. To show the top retweets from any public Twitter account (including your own), you need to first search for the Twitter handle. Tweets are loaded in 200 at a time up to a maximum of 3,200, so you may wish to use the ‘load older’ feature a few times. Depending on the frequency the user tweets, the 3,200 limit may cover a period of weeks, months or years. Tweets shown will also include retweets of other accounts. If you want to see tweets just from the account searched for, you can select that account from the ‘contributors’ list in the filter sidebar on the left. Not only can you see which tweets has been retweeted the most, you can also order tweets by top favorites, accounts reach and engagement rate (the ratio of favourites or retweets compared to follower count). The image below shows top favorites using the list layout; another useful way to view tweet information. Pro tip: You can also search for tweets from any Twitter user using the ‘from’ field in the advanced Twitter search. This will search tweets from a particular handle from the last 7 days instead of the last 3,200 tweets. This could be useful for very active users, who tweet more than 3,200 times in a week.